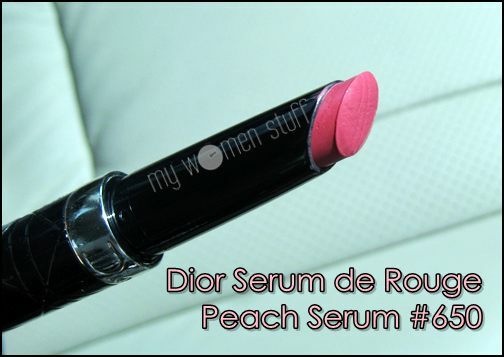 When I first laid eyes on Peach Serum #650 – the new colour in the Dior Serum de Rouge range of lipsticks, I was a little puzzled. You would be too once you see the colour in the picture – as close to the real thing as I could manage to get it. I found myself wondering if someone had somehow played an April Fool’s joke on me by labeling this colour “Peach Serum” so I did a quick online check. Yes indeed. 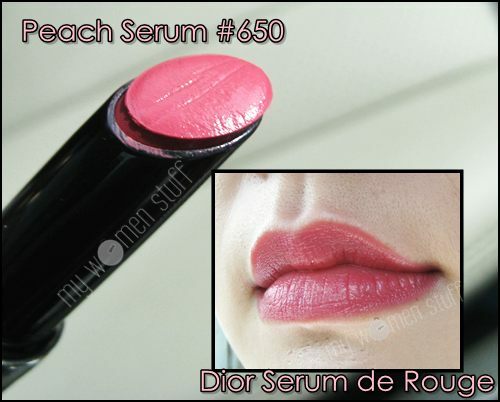 #650 is called Peach Serum, one of the new colours available in the Dior Serum de Rouge line of lip treatment lipsticks. If you are wondering how “peach” Peach Serum is, my answer is “Not at all peach!” Peach Serum, despite its name is a very soft pink which I was initially scared of which was silly of me because its so gorgeous once I slicked it on! On my lips, Peach Serum looks pretty much as it does in the tube. A soft rosy pink. The fact that the lip swatch looks as it does in the tube tells you that its pigmented which I love. The picture shows it swatched just once. This is a colour you can easily wear everyday of the year night or day without raising eyebrows. Like the other Dior Serum de Rouge lipsticks, Peach Serum retails at RM109 at all Dior counters along with a whole new bunch of colours! I’m glad Dior is expanding the colour selection for Serum de Rouge. They know they are onto a winner! Update: Other new colours in the Dior Rouge de Serum range are 860 Violet Serum and 660 Garnet Serum. Garnet Serum sounds pretty! PREVIOUS POST: Can you guess what this is? I’m on super high alert today because I’m wired to be a paranoid freak. A bunch of the more playful ones are here in my building today and I’m EXTRA PARANOID. I also found a fart balloon on my chair this morning after I hopped off to get coffee. Might this be the colour that breaks that resolve? 😉 Wait till you come back la! I’m not pranking anyone but the Fates pulled lots of pranks on me! the more you talk about the serum de rouge, the more I want it! You’re absolutely right! Hit them when they aren’t looking LOL… and for me serum de rouge is worth saving up for. Serious! but this colour is so pretty still !!! It is isn’t it? 😀 I’ve been wearing it for a week and still not tired of it! My answer: I don’t. I don’t take testers anywhere near my lips if I can help it so although the back of the hand isn’t the best place to test lipsticks, that’s where I do it. If you’d like to test it on your lips, request for a cotton bud and swipe it on. Do not reuse or reswipe the lipstick. Most department store counters will know how to let you test a lipstick on your lips if you want to. At the drugstore or pharmacy, don’t. You don’t know where the testers have been! You have FOUR of them? o_O They must be amazing.